Had anyone else read this story of David Airey’s domains being stolen from him because of a Gmail exploit? Both of David’s domains have been subsequently restored, thanks to the publicity he received this week. Let’s all take a moment and remember the good old days of the Internet in the 1990s … the Netscape Web browser is being end of lifed as of Feb 2008. If you didn’t catch Code Rush, a documentary on Netscape which was shown on PBS in 2000, I highly recommend you do so. This particular crawler is being deployed from the Semantic Web Search Engine (SWSE) project, which is attempting to crawl the nascent Semantic Web, including RSS and FOAF data. This is yet another reason why deploying RSS is a good idea for any Web presence. Here’s a link to the SWSE search demo. Has anyone else seen some different activity coming from MSN? What I mean is that I’m seeing the following entries in my search logs, but it doesn’t appear like traditional MSNBot crawler behavior. 1) The originating IP address is from the MSN netblock. 3) The user agent is showing as a browser. 4) This activity is showing very close to when I see MSNBot entries in my logs. And no, the behavior does not appear to be a real life user. New crawler in my logs from an outfit called Radian6. From the Web site, they look to be a social media monitoring service for the Google Alerts challenged, I guess much in the same way as those other pre-existing social media monitoring services. Heh. 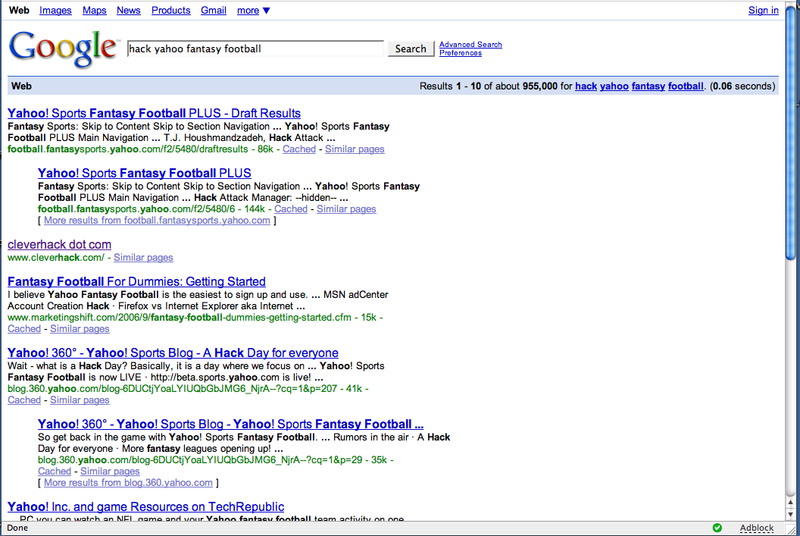 If you happen to Google hack yahoo fantasy football we get a SERP that, well Google isn’t quite sure what to display on the SERP. Cleverhack is currently showing as #3 on the SERP, but with no related text. I’ve never seen a SERP quite like this one before. You see, I’ve been getting a bunch of hits for this particular keyword combination, but what is most interesting is that up until now, I’ve never used the keywords in a sequential phrase. Sure, the word hack is in the URL, I list Yahoo IM info on my sidebar and I’ve written about fantasy football before (and I’m in the playoffs for two leagues this year! ), but never sequentially, until now. Kind of interesting, and yes I’m ruining the results because I’m blogging about it. And for you guys looking for how to hack Yahoo fantasy football, I don’t have that information on this blog…all I can say is that Randy Moss helped me out and LT has been mediocre up until recently. Two trends I’ve run across recently in the email deliverability world. First, and this is for you designers who have to work on HTML email campaigns, the Email Standards Project. Because, let’s face it, the need to use old school HTML 4 for compatibility with current email clients makes baby jesus cry. It’s been kind of quiet on the spam filtering front, aside from the proof of concept .ogg and .mp3 spam. In real deliverability terms, from what I’ve been seeing, there seems to be an increased reliance on URL filtering and on sending IP reputation. And with that in mind, I was sort of amused to get the following text based email body in my inbox last night. It seems that the spammers are giving up on live URLs and are hoping you’ll be intrigued enough to open a Web browser, find a stock trading site and buy a penny stock. Hi from Christian . Hope your Friday is cool and happy holidays. Something big for [SOME STOCK] over next few weeks. Check otc boards. Keep an eye out for it and get in early. Hey, I’m just impressed the guy wished me happy holidays. You are currently browsing the cleverhack dot com weblog archives for December, 2007.